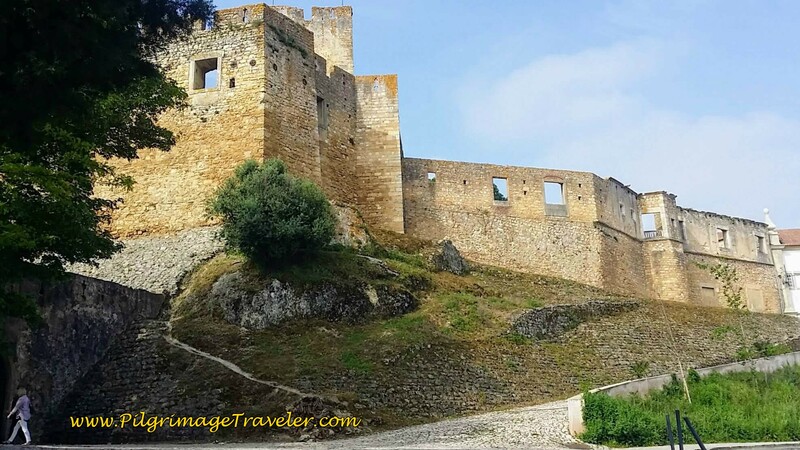 Tomar, Portugal and its Convent of Christ, fortifications and aqueduct is a former Knighs Templar marvel that should not be missed. 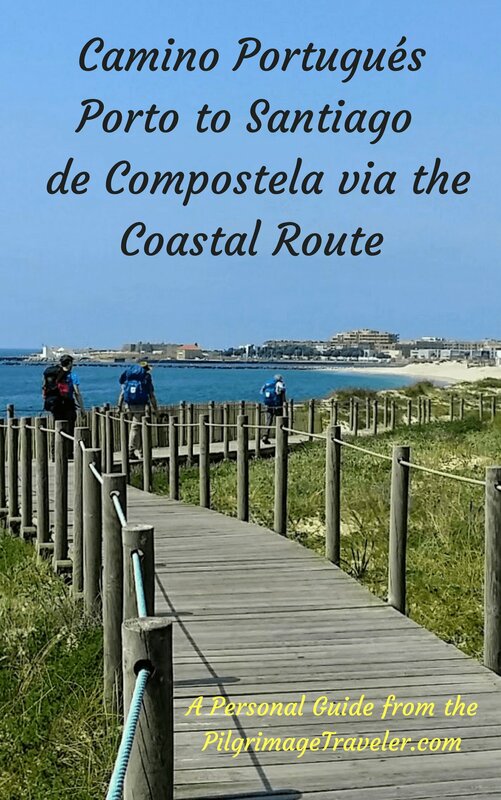 In fact, if you can spend an extra day here, on your Portuguese Camino, like we did, your "rest day" may not be all that restful, because there is so much to see! 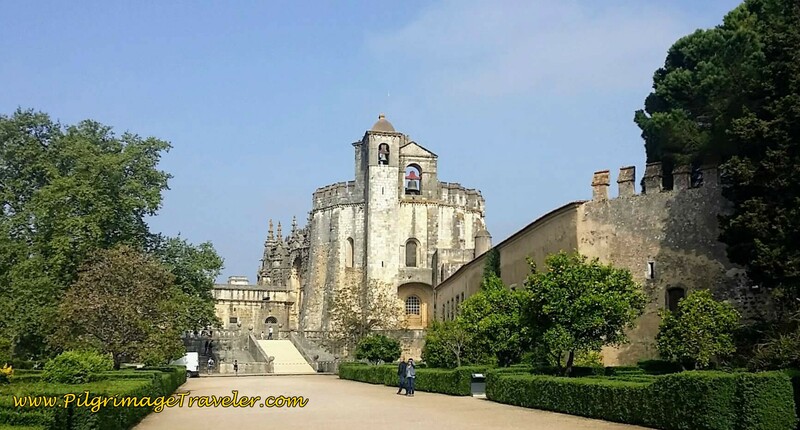 We stayed at the Hostal 2300 Tomar, which was centrally located in Tomar and quite convenient to the sights. Just to the west of our accommodation is the River Nabão. This is a lovely place to stroll along, where shops and restaurants abound. 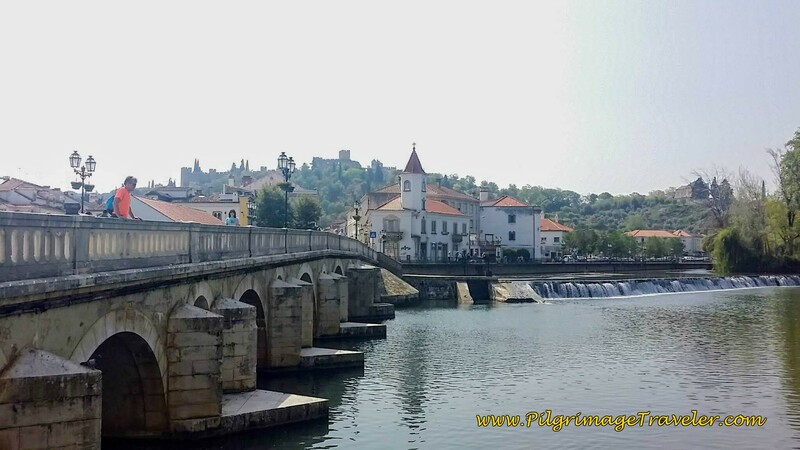 Here is the bridge on the Rua Marquês Pombal in the center of Tomar. 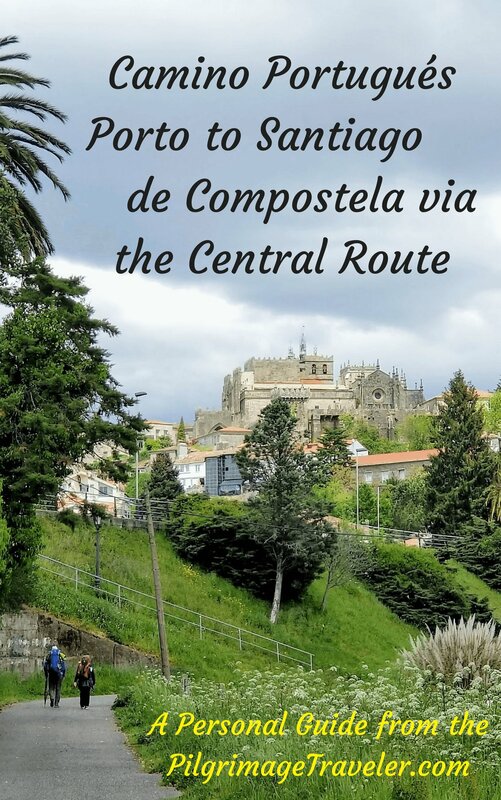 It is on the route where the Camino Portugués continues onward and through town. 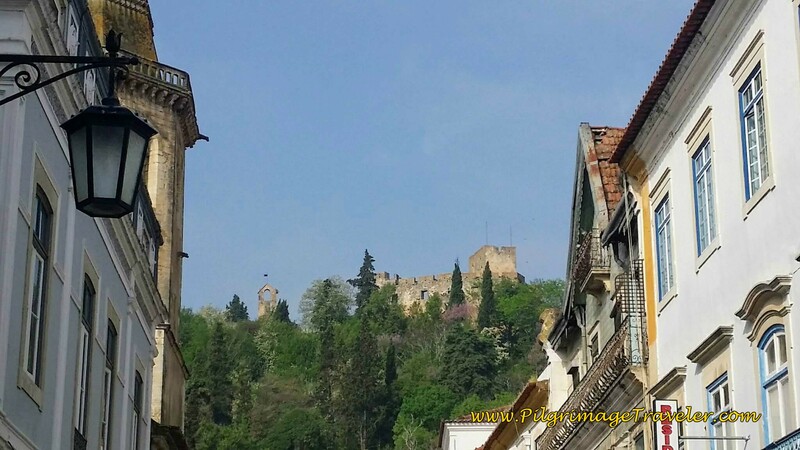 You can see the Knights Templar castle up on the hill in the background. Indeed the castle dominates the view from almost all spots in town! 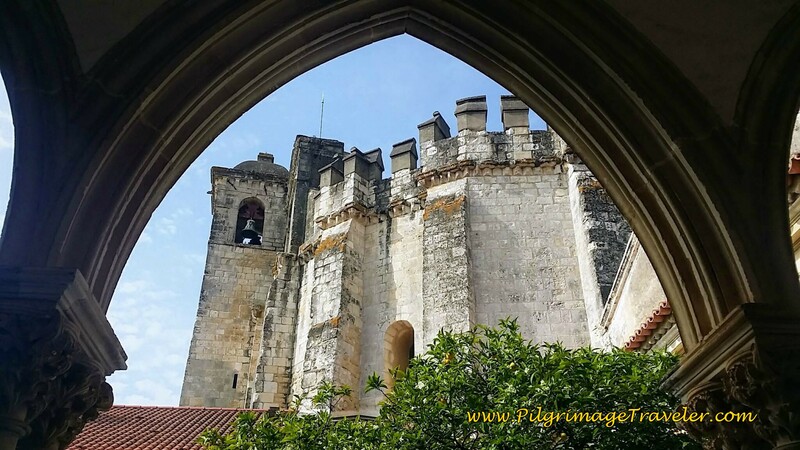 Here is our view as we walked westward on the Rua Serpa Pinto, from our hostal. 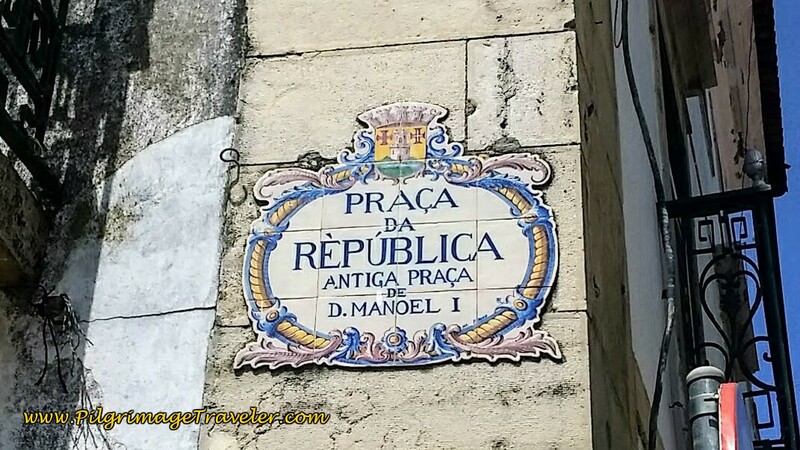 As we continued our walk, we came to the central plaza, where the all the action is, the Praça da Rèpública or Republic Plaza. 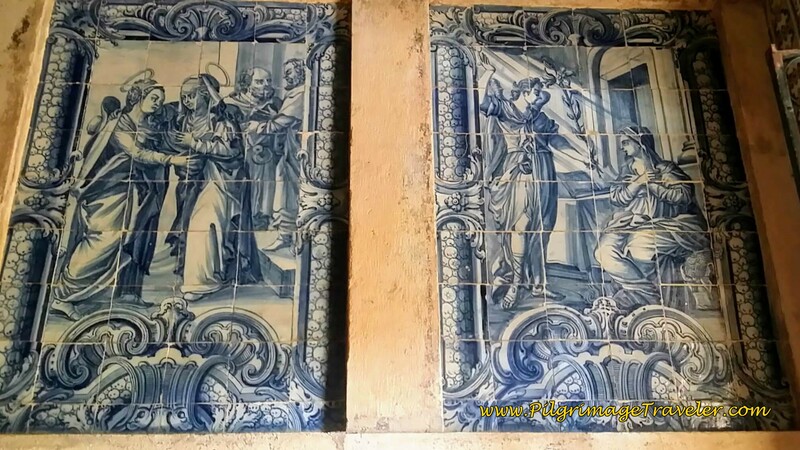 The beautiful azulejo tile on the wall identifies where you are, if you haven't figured it out already! 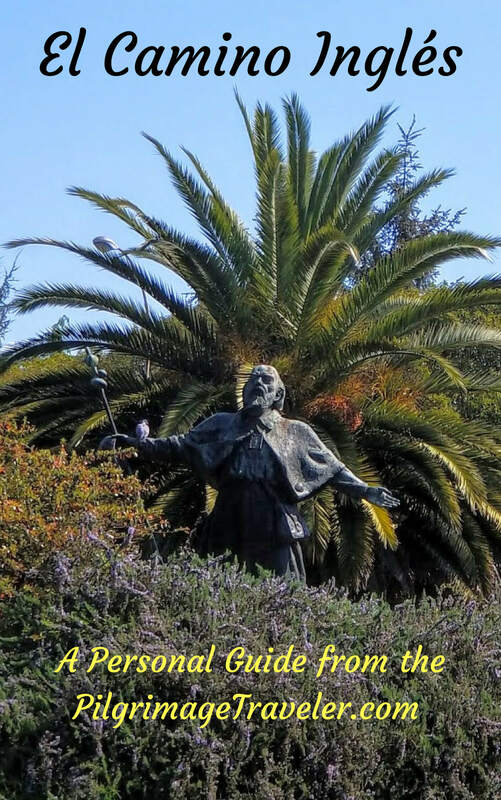 Dominating this plaza is the statue of the city founder, Dom Gualdim de Pais. The city hall or Câmara Municipal de Tomar forms the backdrop, with vestiges of the fortress walls on top of the hill, that can be seen in the background. 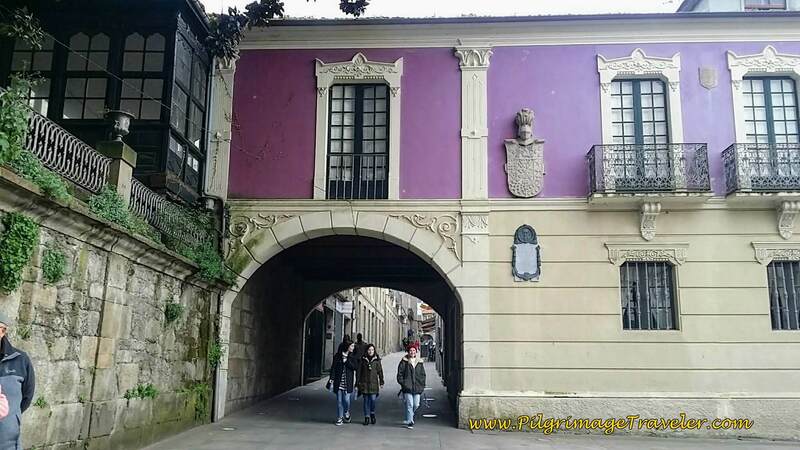 It is a beautiful square, surrounded by cafés and restaurants. For more photos of the square, see day five, but our goal this day was reaching the Convento on the hill. We crossed the plaza towards the City Hall. The way to the Convento de Cristo leaves from the side street to the left of the Câmara Municipal de Tomar (City Hall). This is also the beginning of the Caminho Nascente to Fátima. 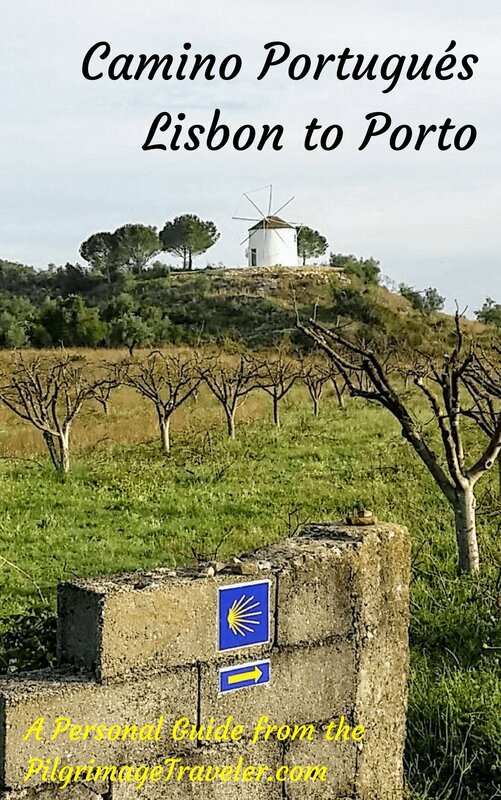 Pictured below you can see the small side street, the Calçada de São Tiago and the blue arrow on the electric box, on the left side of the photo. 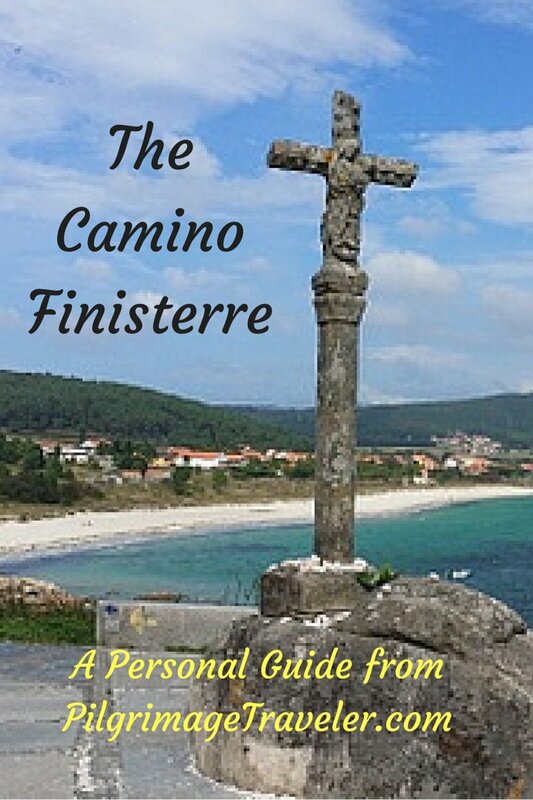 Here is the beginning of the Camino Nascente from Tomar to Fátima. 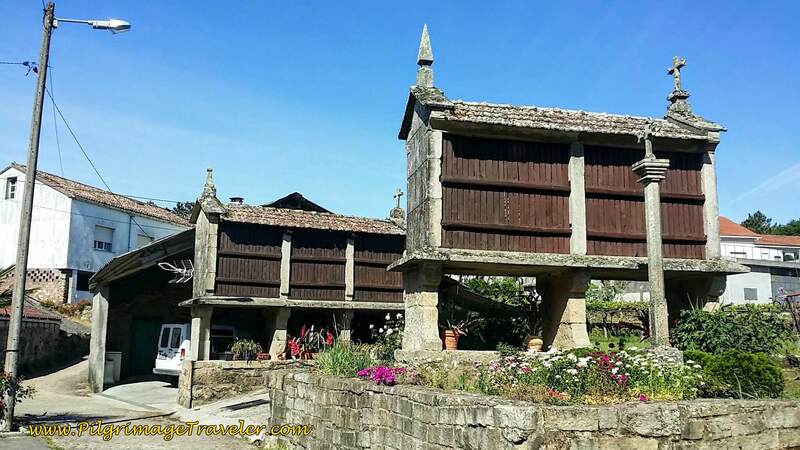 This small side road, the Calçada de São Tiago, turns into a path and begins to climb steeply as it winds around some public restrooms, then walks you up a set of stairs to the Avenida Dr. Veira Guimarães, shown below. You cross this avenue to the cobblestone path. 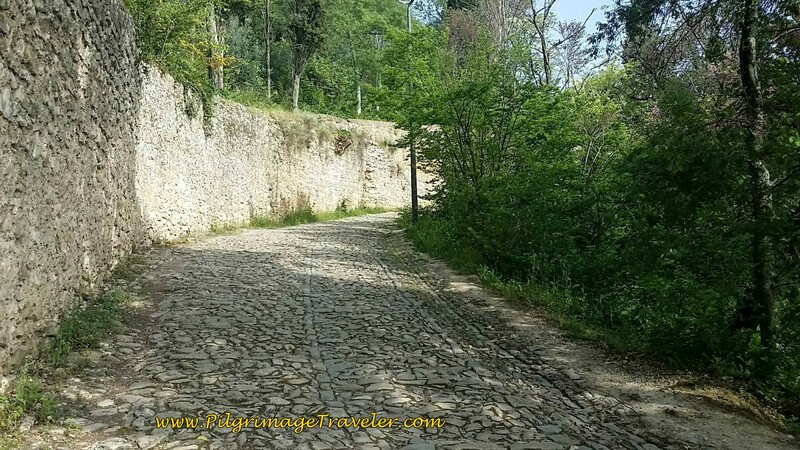 The Camino Nascente continues to the right along the Avenida Dr. Veira Guimarães as the photo shows, but we continued straight ahead and along the cobblestone path shown below, onward and upward to the Knights Templar castle. 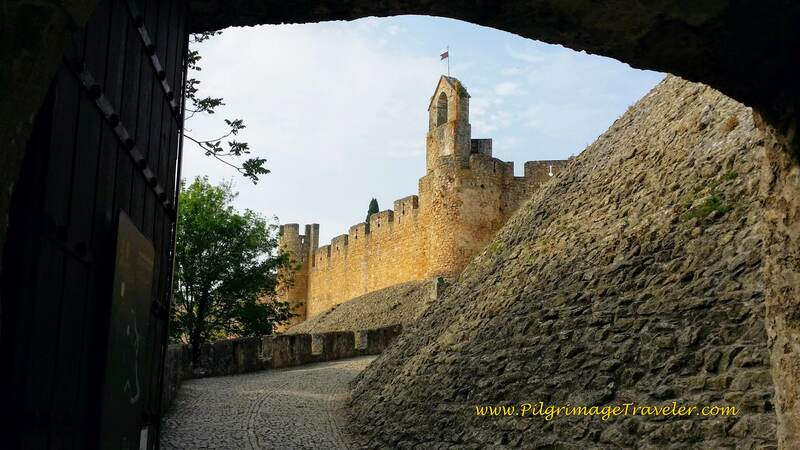 The cobblestone path switchbacks, and around the turn the fortress walls come into view for the first time. The history of this place is quite interesting. 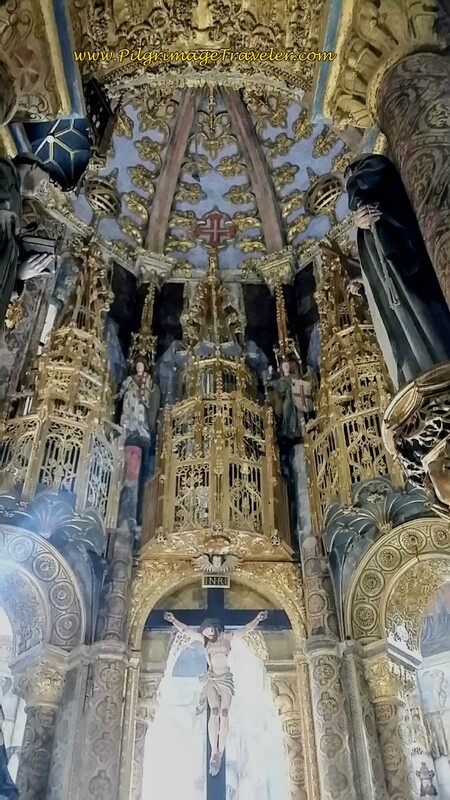 I was fortunate to watch a History Channel program called "The Templar Code" just prior to my visit here. According to the program, the Knights Templar were originally organized by nine knights from a battle in Jerusalem in 1029. This small band became crusaders that solicited wealth from European aristocrats to finance more crusades. 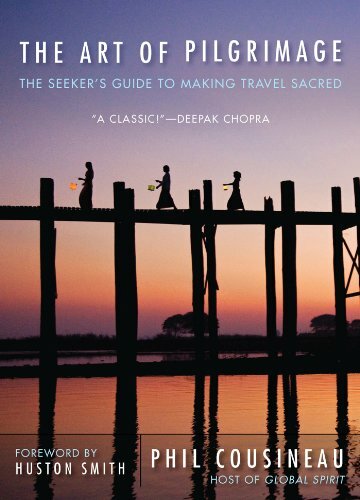 They were essentially a secret society with initiations and were sworn to obedience and poverty. As the Templars grew in size and organization, they became more and more wealthy. 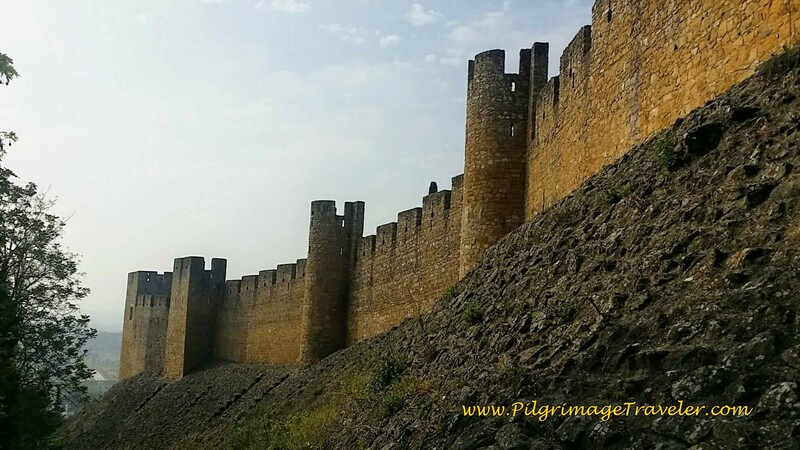 They even established an early banking system along the crusade routes, by issuing promissory notes, purchased by crusaders and pilgrims at their point of origin, to be used along the way. Eventually, in the 14th century, the King of France, King Philippe the Belle, grew to fear the power of the Templars. On Friday the 13th, October 1307 King Philippe the Belle, rounded up all the French templar leaders and their grandmaster and imprisoned them. He held them until 1312, then tortured them and slowly burnt the grandmaster to death. King Philippe actually only captured about 10% of the Templar knights - the rest vanished and despite the torture, no wealth was ever found. History is sketchy regarding the fate of the remaining 90% of the knights. Some apparently fled to Switzerland, others joined Robert the Bruce in Scotland, to fight against the King of England, with the St. Claires of the Rosslyn Castle and Rosslyn Chapel fame, and others just disappeared. 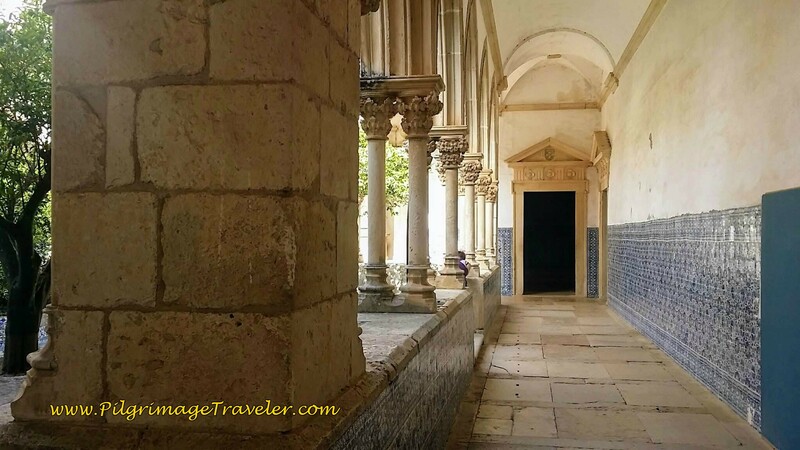 In Portugal, fortunately, the Knights Templar saw the writing on the wall, and they remained safely in Portugal after renaming themselves the Knights of Christ or the Knights of the Order of Christ. Thus, their order was to remain in perpetuity. 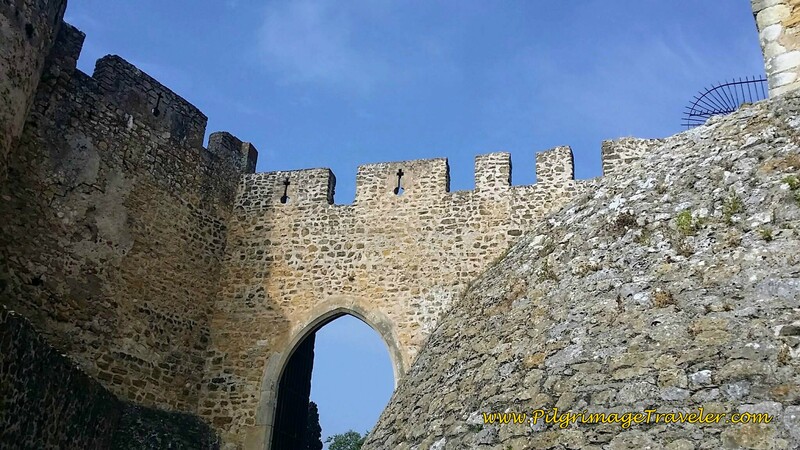 The fortress walls of the Castle are very well-preserved, indeed. Entering through the main gate, below. The embrasures, or keyholes for shooting arrows were fun to see. Here is a close-up. 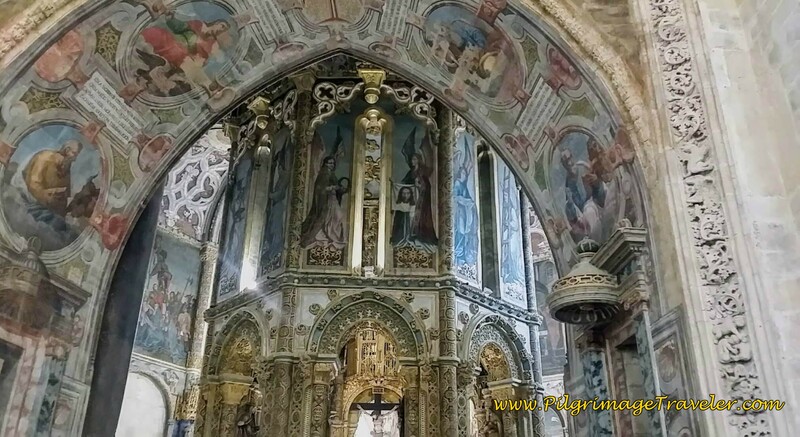 Inside the fortress walls, the crowning glory of the site comes into focus, the Convent of Christ or Convento de Cristo. This is a UNESCO World Heritage Site. 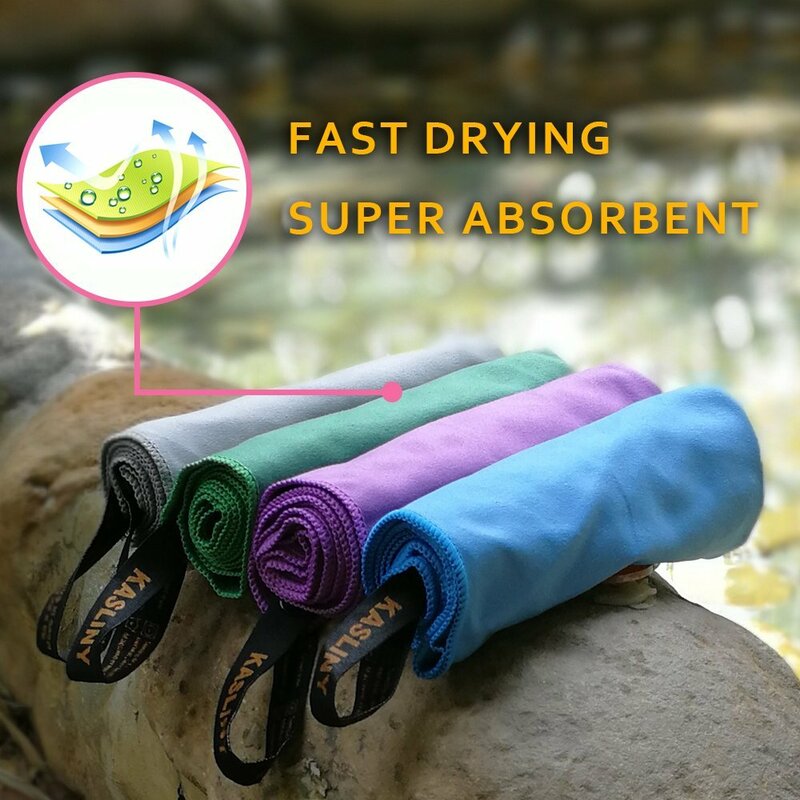 For the official link to this place, Click Here. It is a glorious place. 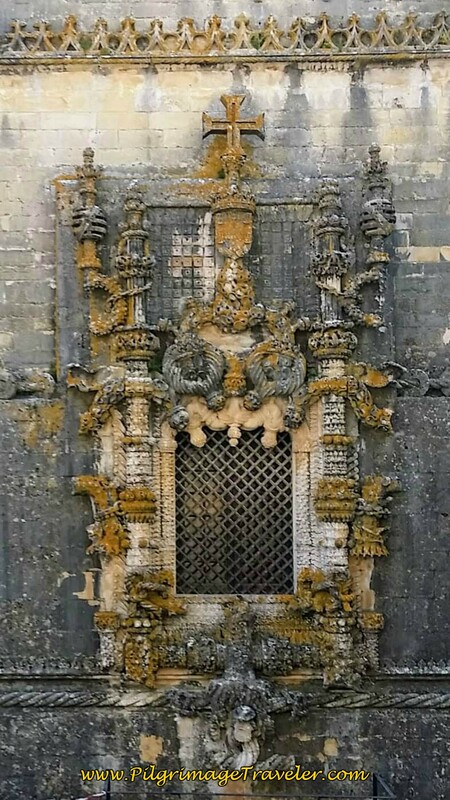 As you walk up the steps toward the Convent, the main entrance door is a glorious manueline embellishment! 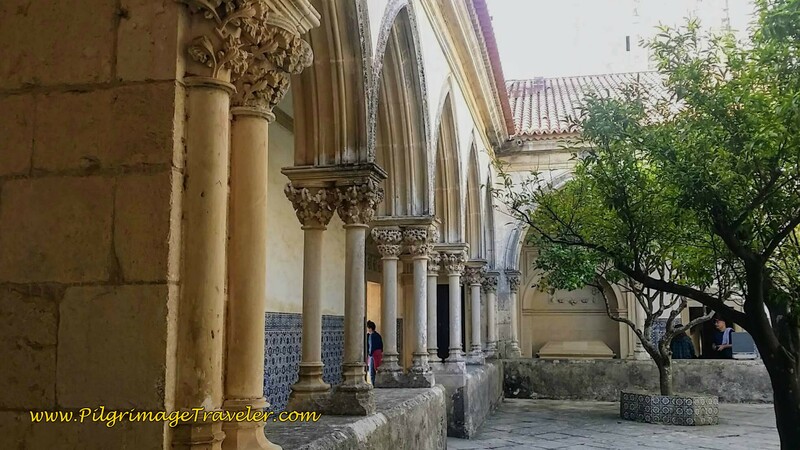 The first stop, after entering, are the main cloisters, Cemetery Cloister (Claustro de Cemitério) where funeral processions and burials of the knights were performed and the Laundry Cloister (Claustro da Lavagem), where laundry was washed in a stone cistern. 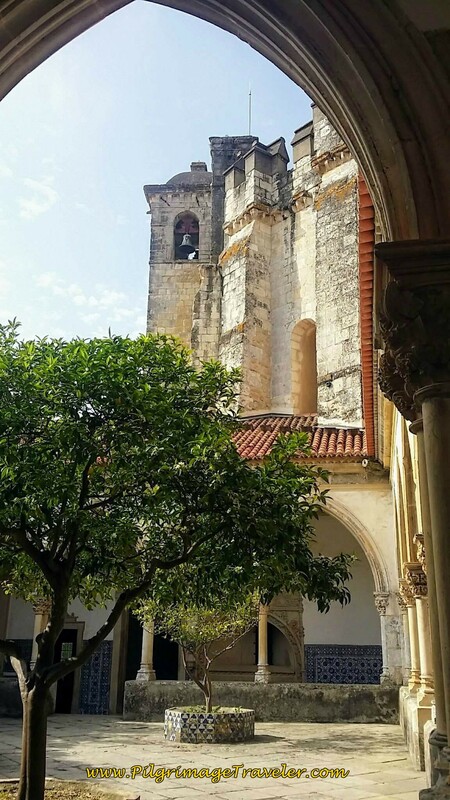 These cloisters are a virtual labyrinth of walkways, all with a view of the main bell tower atop the main chapel. 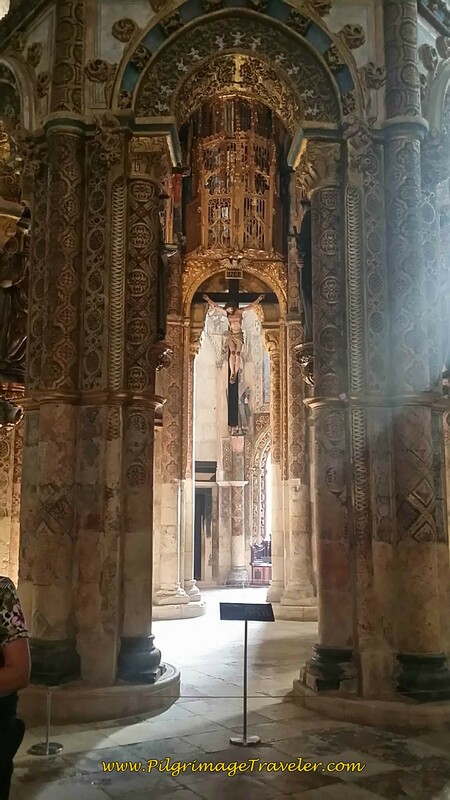 After visiting the main cloisters, we moved onward to the main chapel area. It has its own entrance and this is the archway that opens to the chapel rotunda. 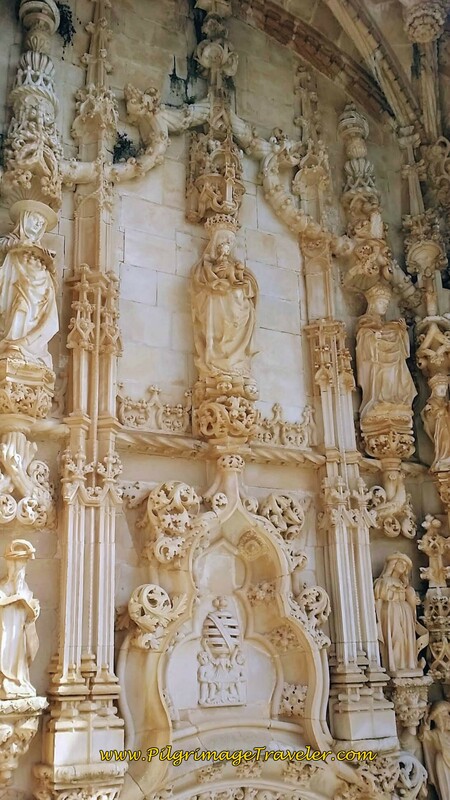 The decoration is elaborate, and I just could not quite capture it all adequately. The sun was streaming in the windows, as it most likely looks at any time of the day, showcasing the center point of Christ on the Cross. 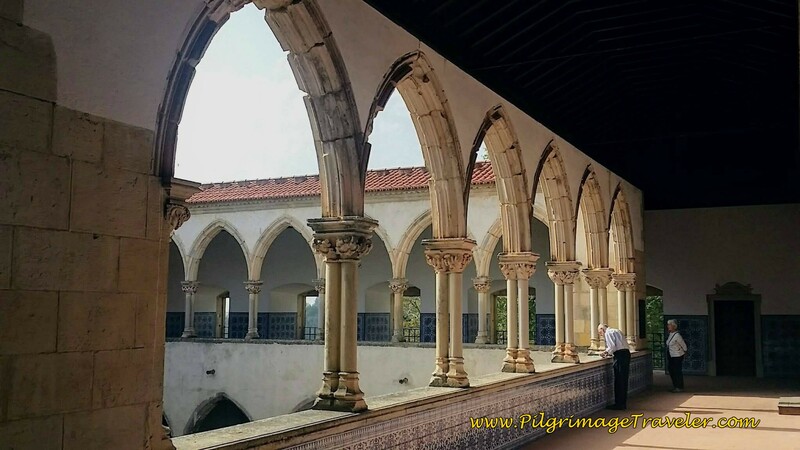 There is yet another, more ruined set of cloisters on the western side of the convent, in fact there are seven cloisters in all! 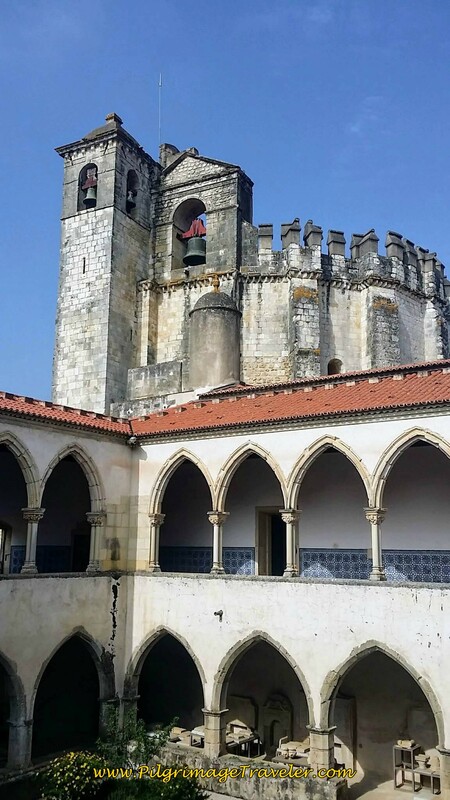 The one pictured below, is the cloister of Dom João III. The circular spiral staircase in each corner was extremely interesting to climb up and down. 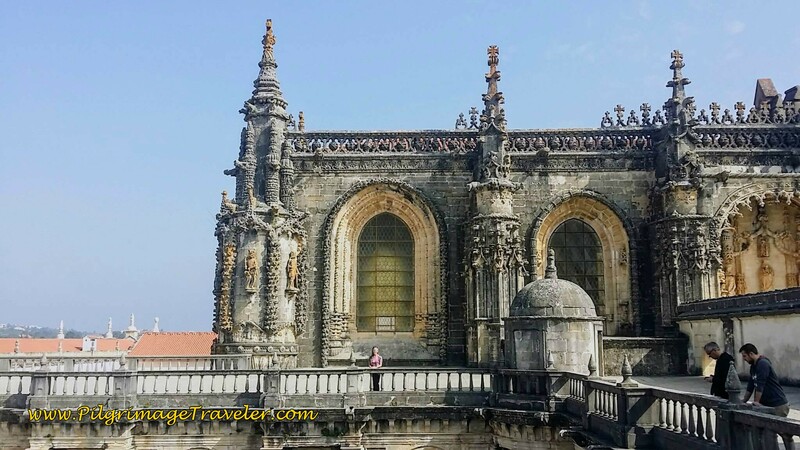 At the top of the Claustro de Dom João III, is a rooftop promenade, and here I am standing in front of the nave of the chapel, with the main entrance door to the right. You can see the top of the spiral staircase on the corner of the balcony. 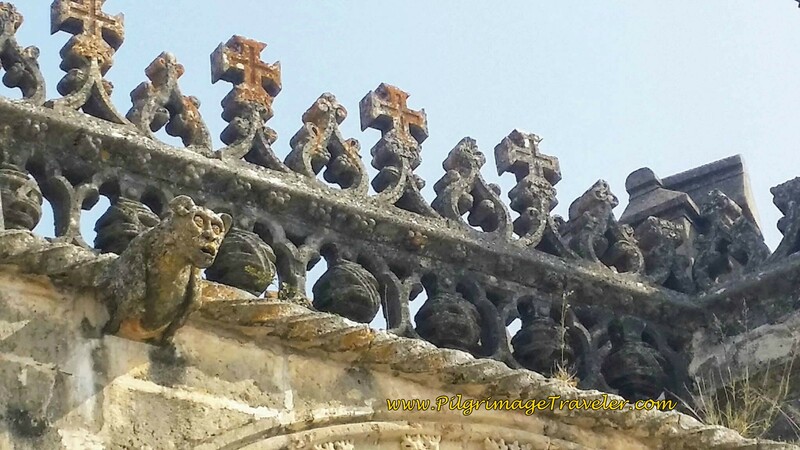 On the roof of the main chapel, these stone embellishments were amazing. 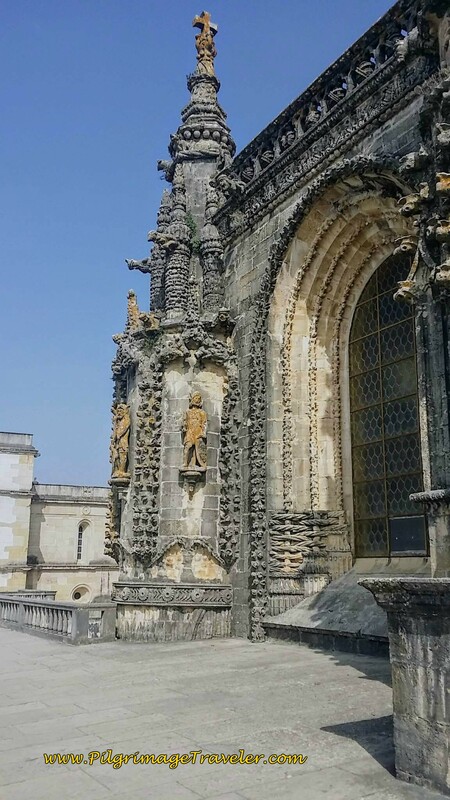 Here is another photo of the architectural features of the main chapel, and the famous Manueline Window on the western facade. 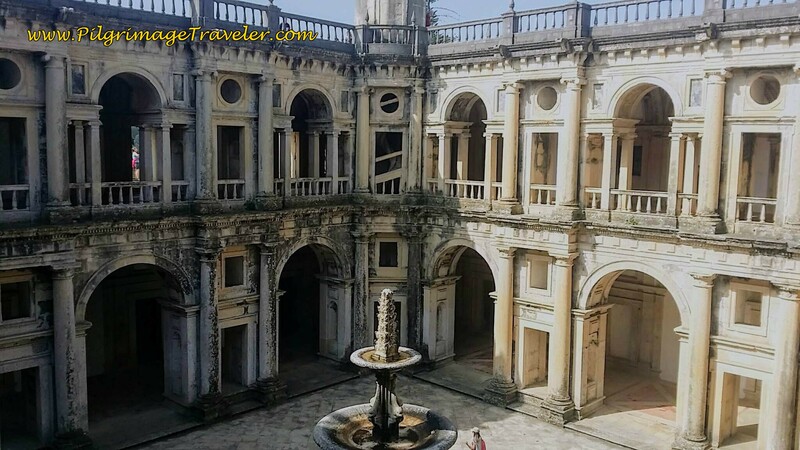 While we explored many more nooks and crannies of this Convent, including the dormitories and courtyards, I have reserved this space only for the most dramatic of the places within. 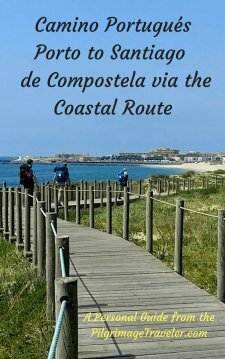 I was amazed by how the site allows for free roaming. There were truly no restricted areas I could see and indeed, this added to the charm of the place. I believe that one could spend an entire day here, but we took a full 4 hours and were quite exhausted by that point. There is a café in one of the courtyards for refreshments, to break up your visit. 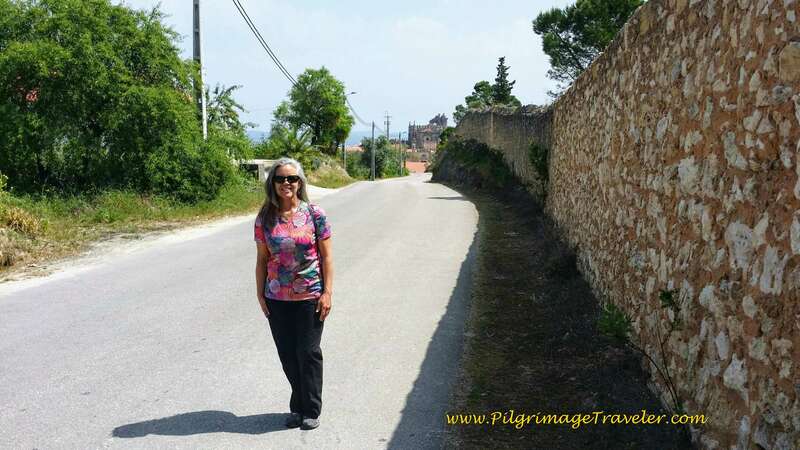 The gardens surrounding the Convent are extensive, which we did not explore much. They are a bit unkempt, but still lovely. One can also walk along the rampart walls, if you have an interest in circumnavigating the site! 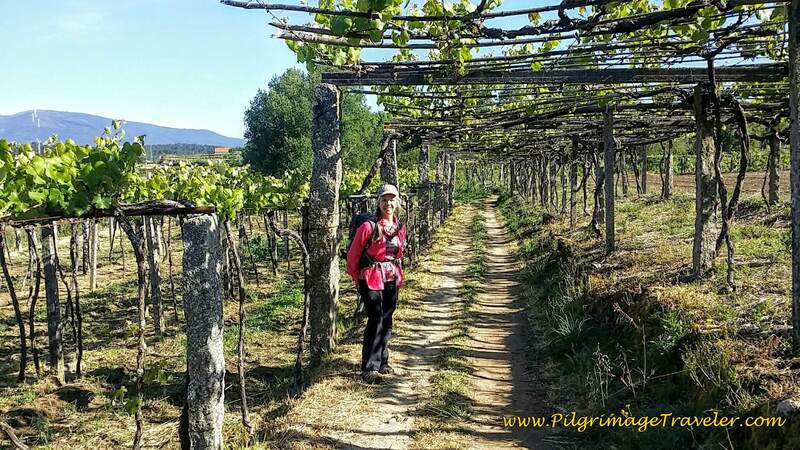 We pondered briefly, whether or not to take a full day to walk the 30 km from Tomar to Fátima on the Camino Nascente. 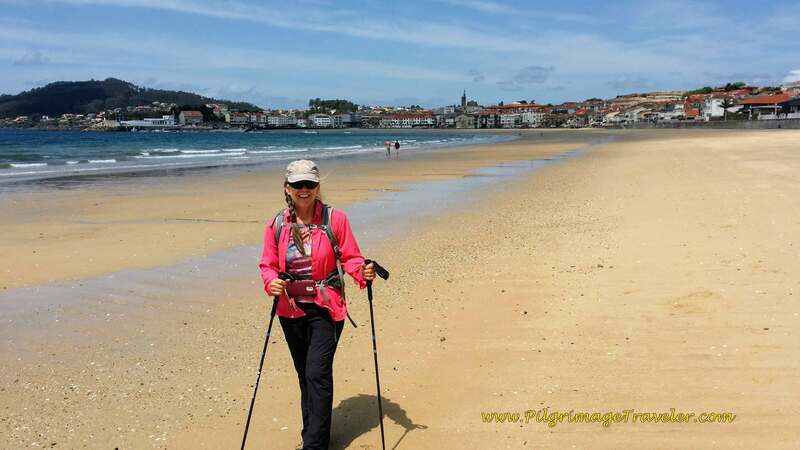 We decided not to do it, and save our energy for the Camino de Santiago. 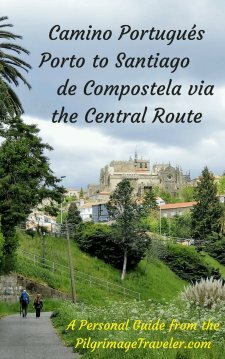 In retrospect, I wish we had done it, but at that time, we were worried we would run out of time, so this Camino was shaved off the itinerary. 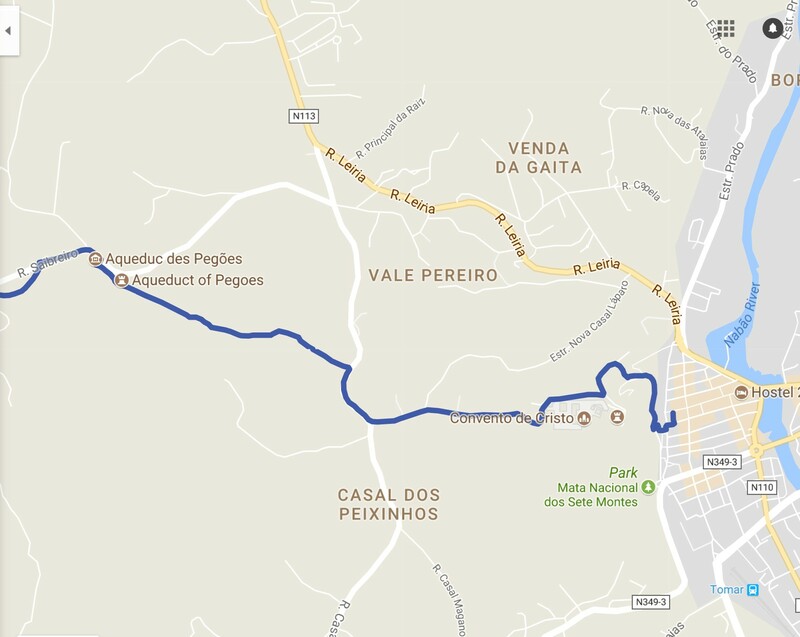 We did want to see the Aqueduct of Pegões, just outside of the city, and below is a map of the route we took. 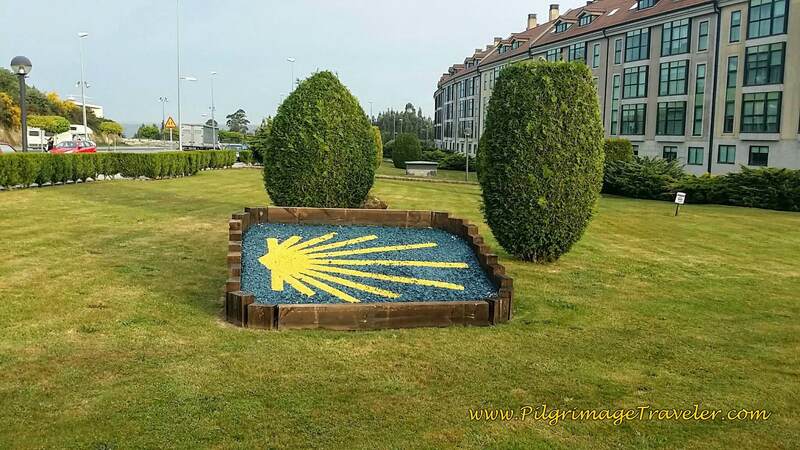 It is a 2 km walk to the aqueduct, and one merely has to follow the well signposted Camino Nascente's blue arrows to Fátima! Here is a Google Earth map of the entire Caminho Nascente, if you are interested. 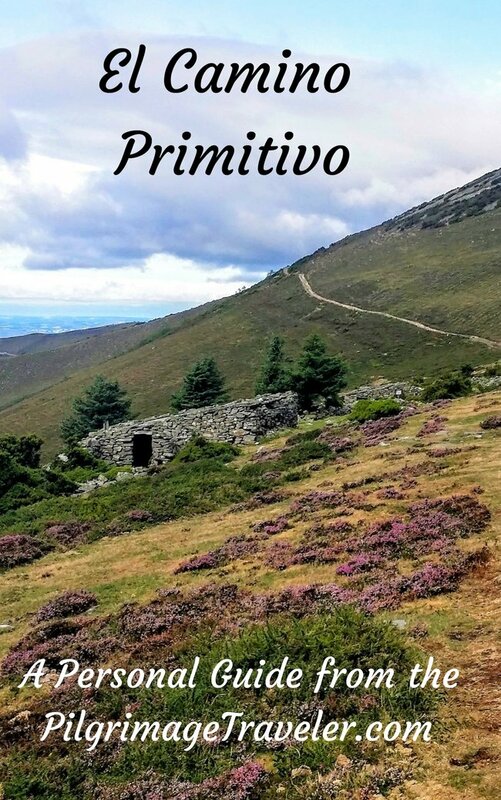 The best place for more information and maps on this Camino is at Caminho.com. 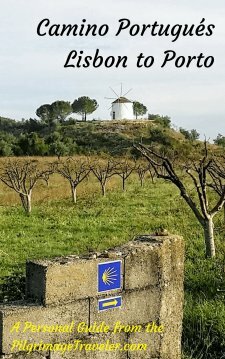 You can also go to the Amigos do Caminho Facebook Group. 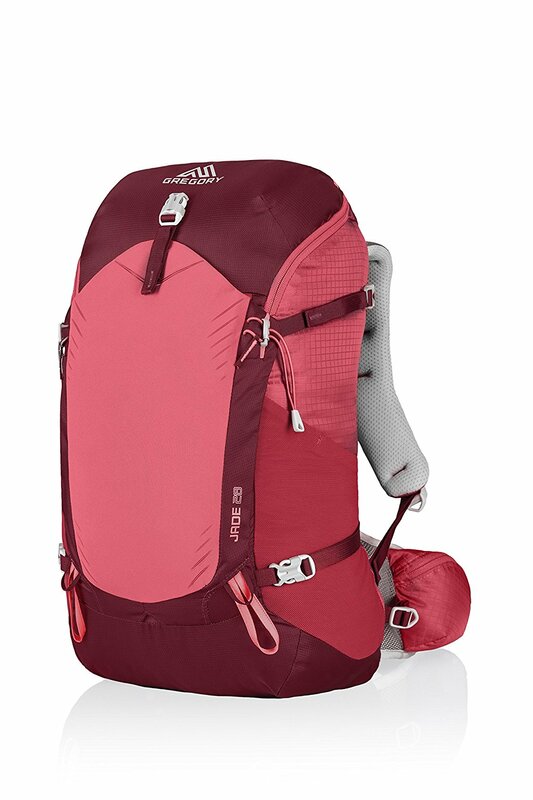 The route is 30 kilometers, a long day for most. 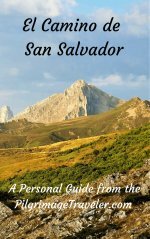 I am happy to say that as of fall of 2017, there is now an open albergue about halfway, in Fungalvaz, to break up the trip. 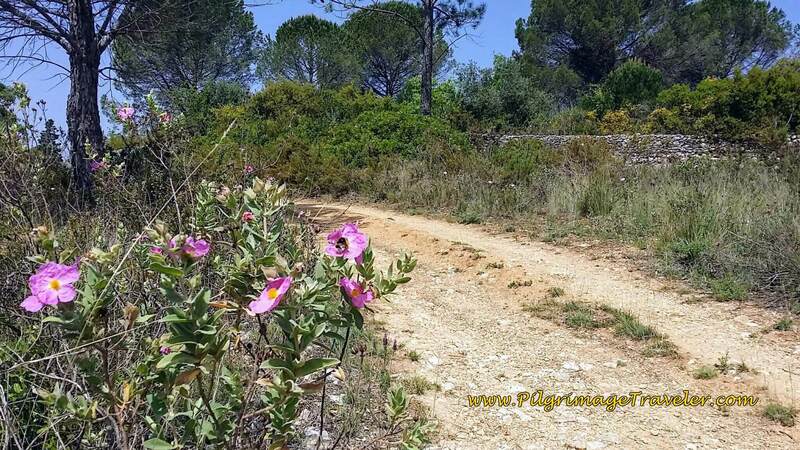 It is a parish pilgrimage albergue. There are two numbers to call, see them in the photo below. The first number is for the daughter of the owner, who speaks English and the second number is to the Padre of the Church. This sign can be seen on the church. Either one can give you the key to the albergue. 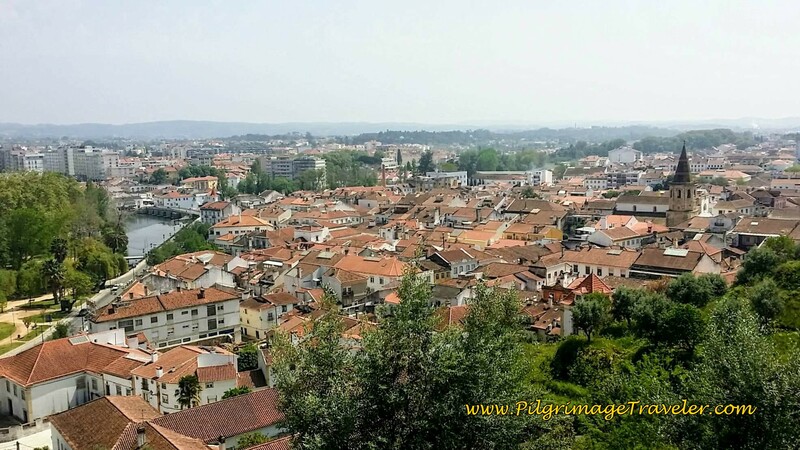 Back in Tomar, leaving from the City Hall, as shown in the beginning of the article, the Caminho Nascente climbs toward the castle, then walks around and to the north of it on the Avenida Dr. Veira Guimarães, as described above. 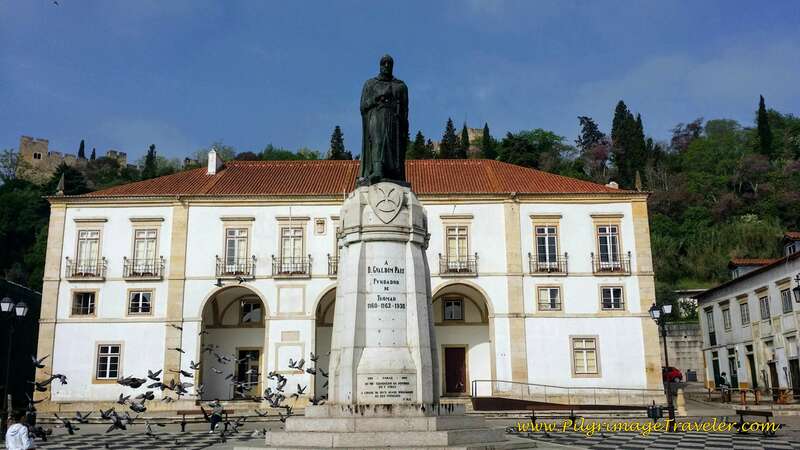 Then onto the Estrada do Convento, directly north of the Convent. 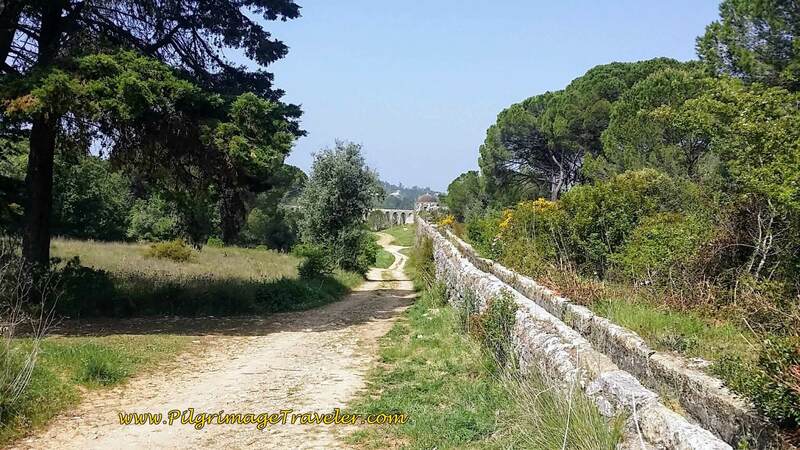 As you walk around the back of the convent, you see the entrance of the aqueduct to the castle. 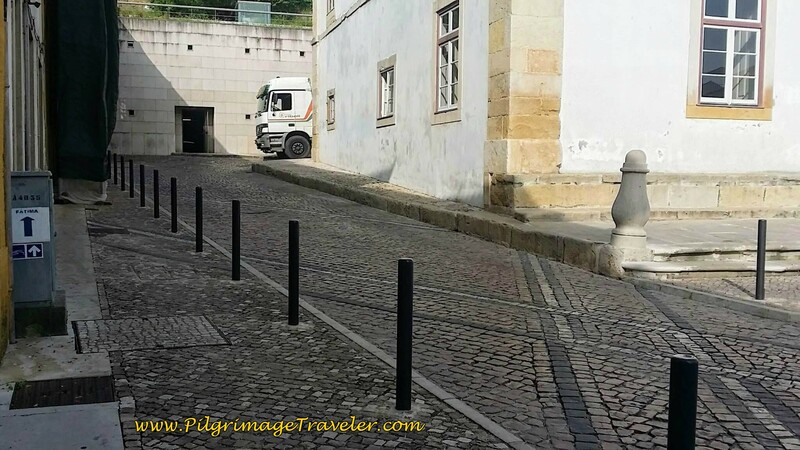 The road turns to the right and becomes the Rua Cadeira D'El Rei. The Caminho Nascente follows the aqueduct and this street. Here I am along the Rua Cadeira D'El Rei. The Convent is directly behind me. 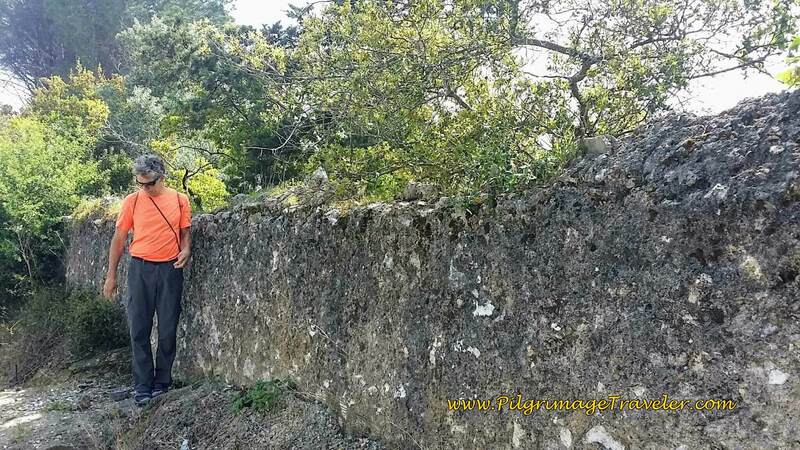 Here the aqueduct is only a wall now, or maybe this was still part of the fortress wall, I didn't know for sure. 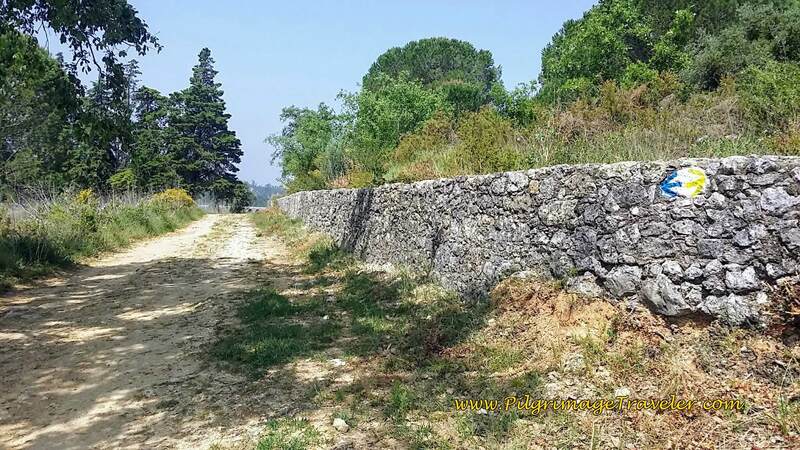 And the wall/aqueduct continues on westward and becomes even more rustic. You continue on the Rua Cadeira D'El Rei until coming to a T intersection. 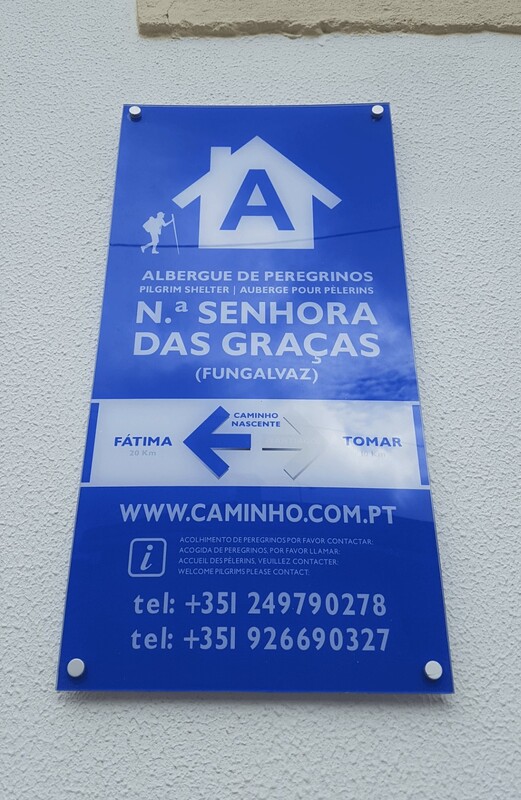 Follow the blue arrow to the right and onto the Rua Casal Magano. 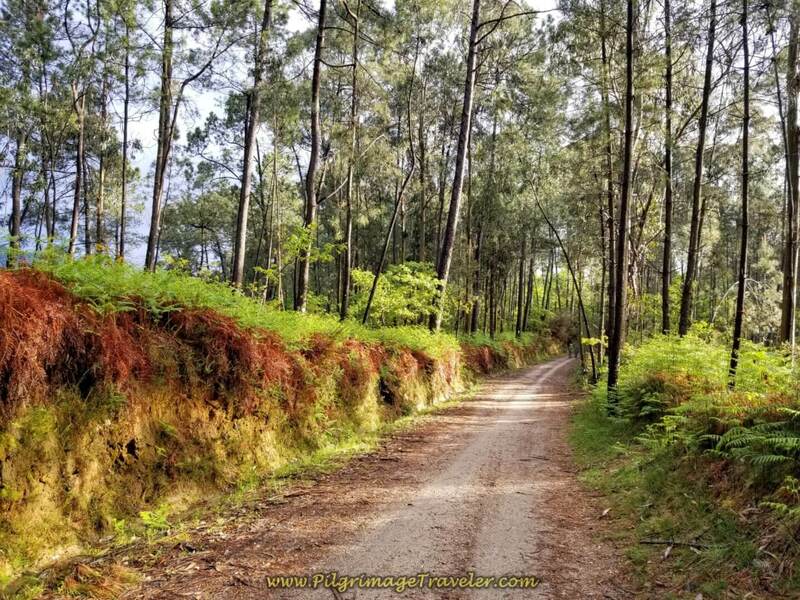 Take the Rua Casal Magano for barely a half a kilometer, and the way turns left unto a dirt path. 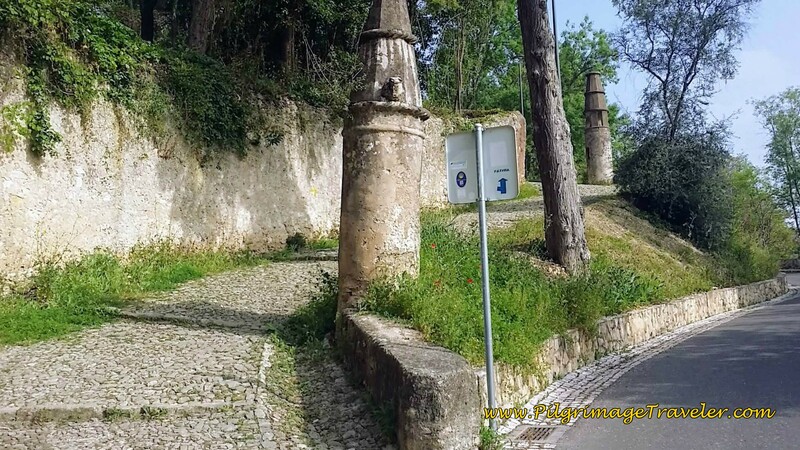 Follow this path and very soon vestiges of the Aqueduto dos Pegões appears. 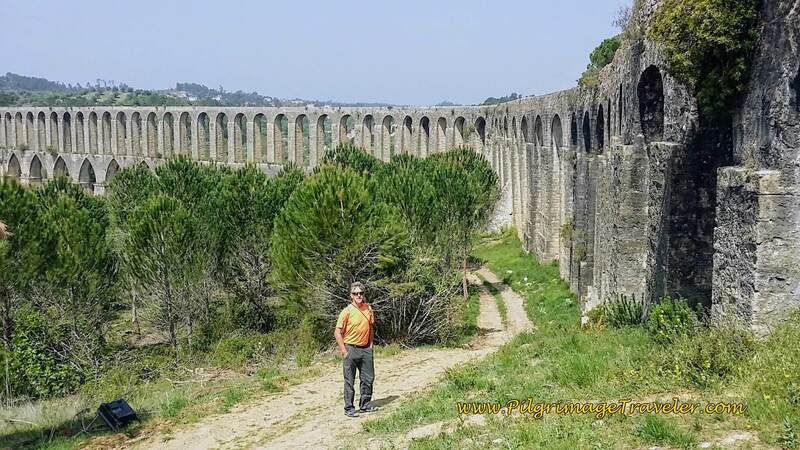 The Caminho continues to follow along the aqueduct, very low to the ground in places, like below, as the terrain changes. The blue and yellow arrows abound, on the rocks and on the aqueduct walls. 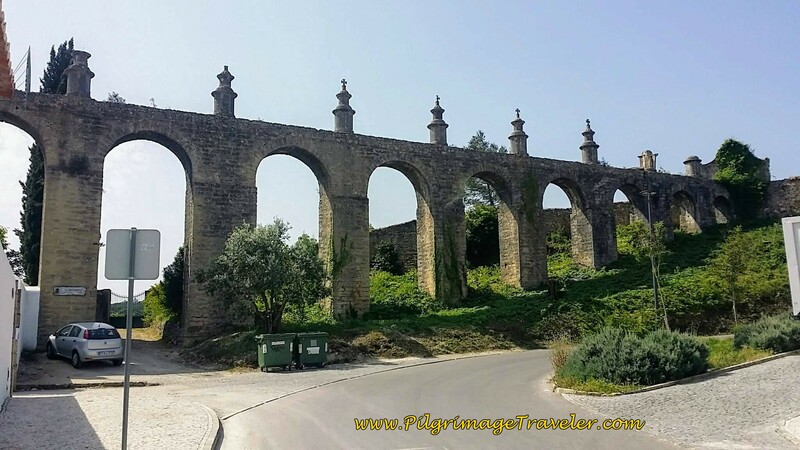 This is the first glimpse of the most dramatic section of the Aqueduto dos Pegões, ahead. 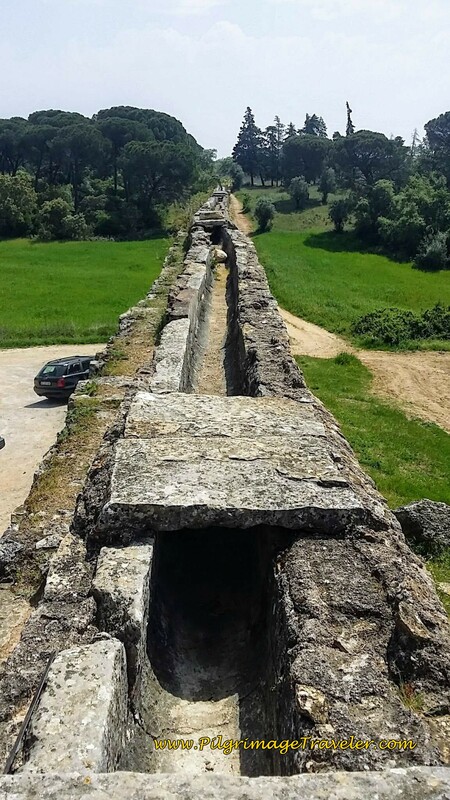 It is an amazing thing, this aqueduct, 30 meters high in this section. 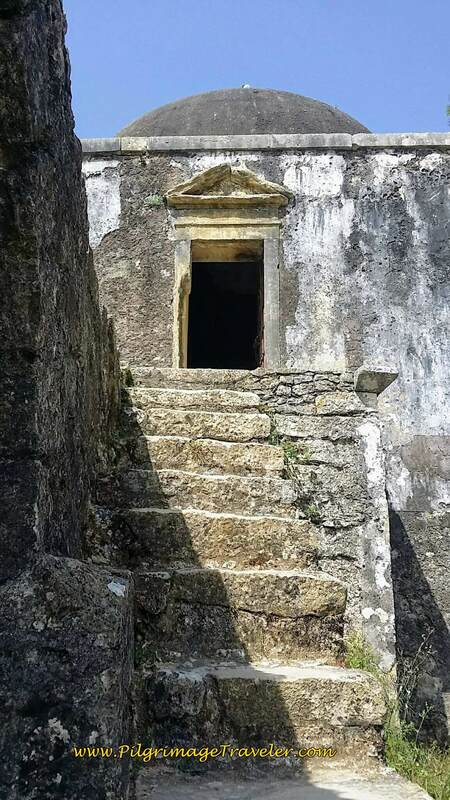 If you walk on the path under the archway to the right, above, you see a staircase to the top, within the small enclosure, below left. Once on top, the views are quite thrilling! 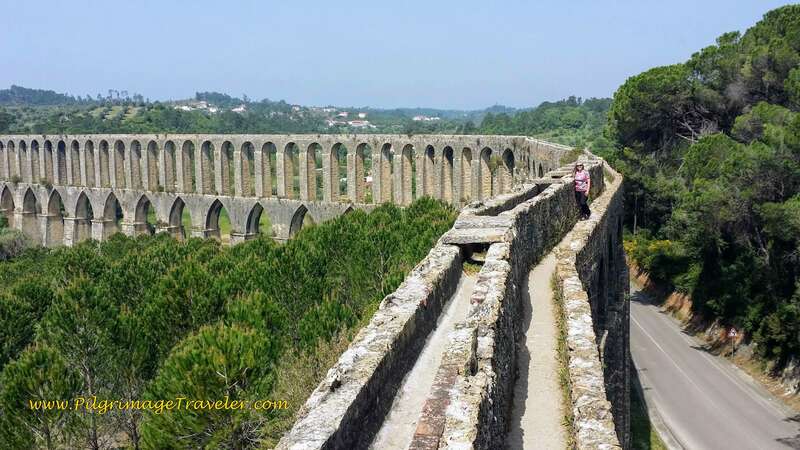 Below, right is a photos looking back towards Tomar, Portugal. A car parked below in the car parking lot gives a bit of perspective. Looking the other direction, is the thrilling part. 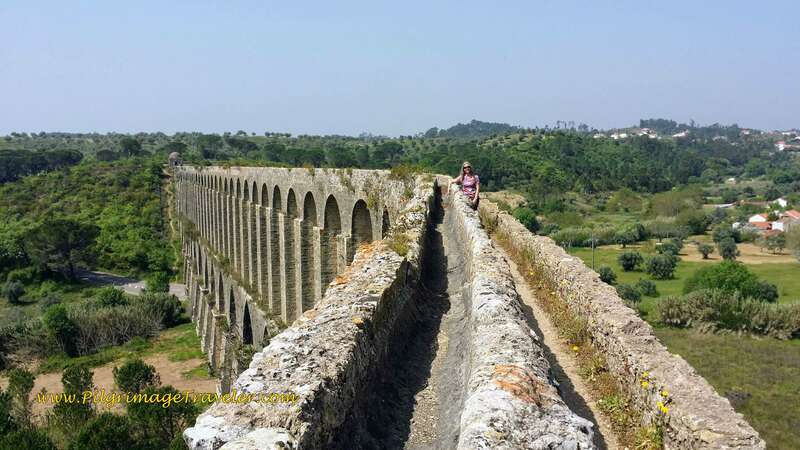 Here I am, on the aqueduct with no walls to the right to catch me if I fell! 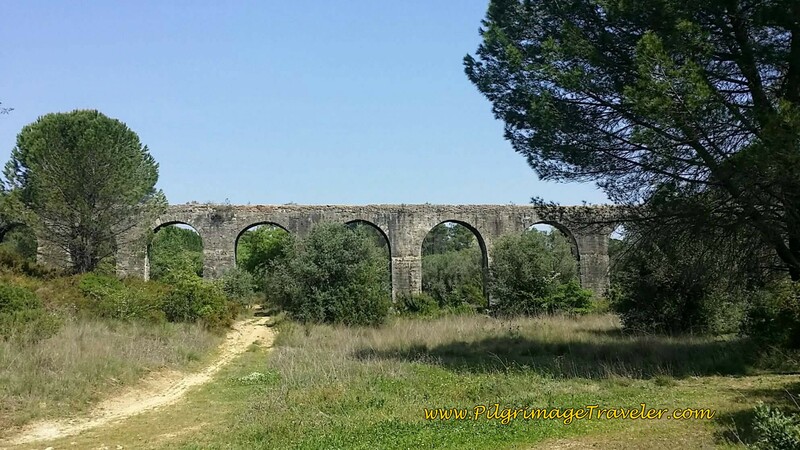 Here is another view of the aqueduct. You can walk all the way, on top, to the end, but the solidarity of the structure got more sketchy for me to do so! 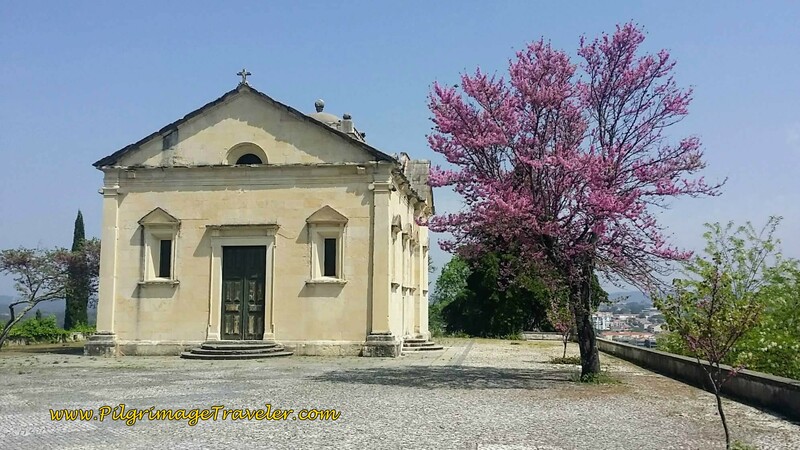 Enjoy this amazing and historical place, built in the mid-sixteenth century, and is six km long, and once upon a time, supplying fresh water from four natural springs to the Convent! 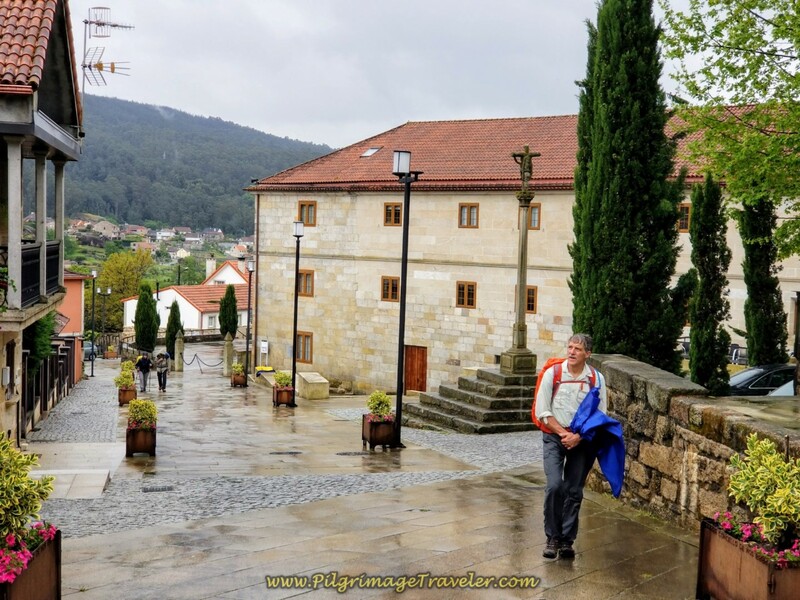 Walking back into Tomar, Portugal, our final stop immediately north and east of the Convent was this charming little edifice, the Hermitage of Nossa Senhora da Conceição, below. 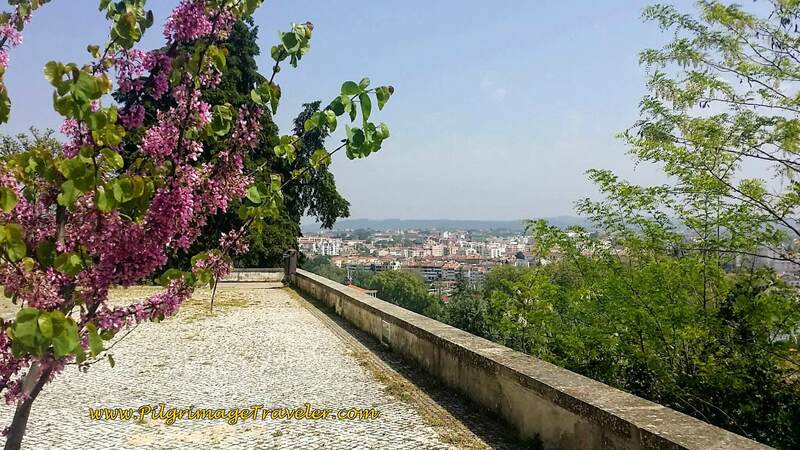 On this lovely spring day, the views of the city of Tomar, Portugal were fantastic from this terrace by the Hermitage. Unfortunately, the little chapel was closed to the public. Here is yet another gorgeous view of the city from the terrace wall. It was worth the visit, just to see the view. 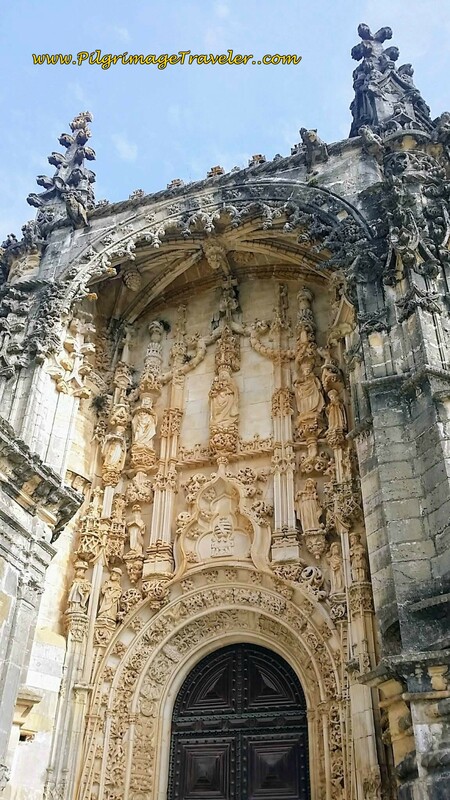 I hope you have enjoyed my brief tour of the major attractions of Tomar, Portugal. It was a glorious day of "rest" for us, even though we most likely walked a good 8 kilometers anyway! But the town is so worth visiting for a day, and the history here is fascinating! 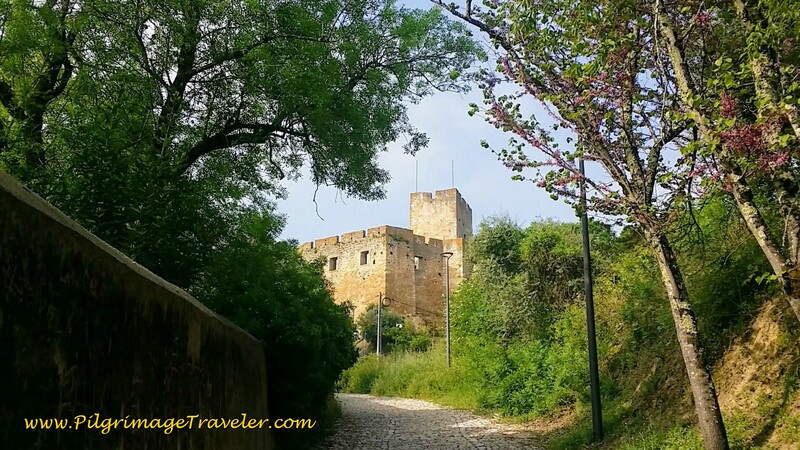 May your own Camino Portugués be enhanced by a visit to the historic town of Tomar, Portugal!